Another week means more Fortnite Battle Pass challenges. Challenges are live now, rewarding you with bonus Battle Stars and XP if you complete them. 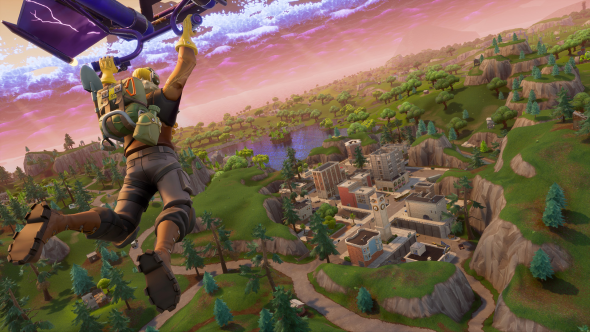 Improve your chances with our Fortnite tips and tricks. There are, as always, seven Fortnite Week 5 challenges (four normal, earning you five battle stars, and three hard, which will net you ten stars). Here’s what they are, and how to beat them. This challenge is a little tricky, as you have to actually find a Bush disguise before you can complete it, but once you’ve got hold of one, just equip it and you’ll earn yourself five stars. You’ll need to open seven chests in Moisty Mire, in the south-east corner of the map, to complete this challenge. To complete this challenge, you’ll need to deal 200 damage to opponents with your pickaxe. I’d try to do this at the beginning of a match, ideally when your target doesn’t have a gun. You need to visit three gas stations to complete this challenge. There are eight in total on the map, and are easiest to find in Pleasant Park, Greasy Grove, Tomato Town, Salty Springs, and Retail Row. There’s also one just north of Lucky Landing, but you should try to pick an area with lots of Gas Stations close together. You can find the treasure map in one of the barns near the Anarchy Acres farmhouse, pointing you towards a large rock south of the giant llama and west of Junk Junction. That’s in the north-west corner of the map, in grid square B2. Kill three enemies with a pistol. Use the silenced pistol if you’re feeling sneaky, or the Handcannon if you want to pack a punch. Eliminate opponents in Tilted Towers. You’ll have to kill three enemies to complete this challenge. There’s usually plenty of people there early in the match, so grab a weapon quickly and get shooting. If you haven’t completed challenges from previous weeks yet, remember they’re all still available, so you can still earn your bonus stars and XP. Check back next week for the Fortnite week six challenges.